The Best Way to Learn Briefs, Ever! You may have seen this article on a couple of differnt forums. You may also have seen this article here on ol' Cheap and Sleazy, on the main page. Well, I didn't think that was the best place for it ... so I asked Keith to take a few screenshots, so I could turn it into a regular article. He agreed, and this article is the result! 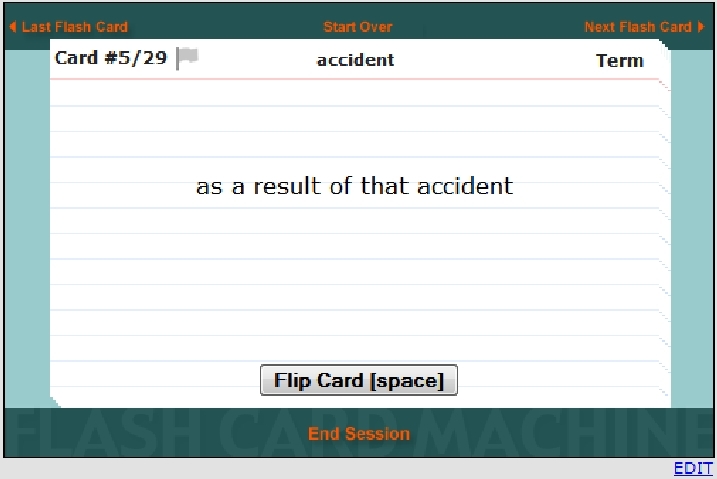 Many of us have used flashcards to practice or learn material. You may even have done it in your theory or bridge class. 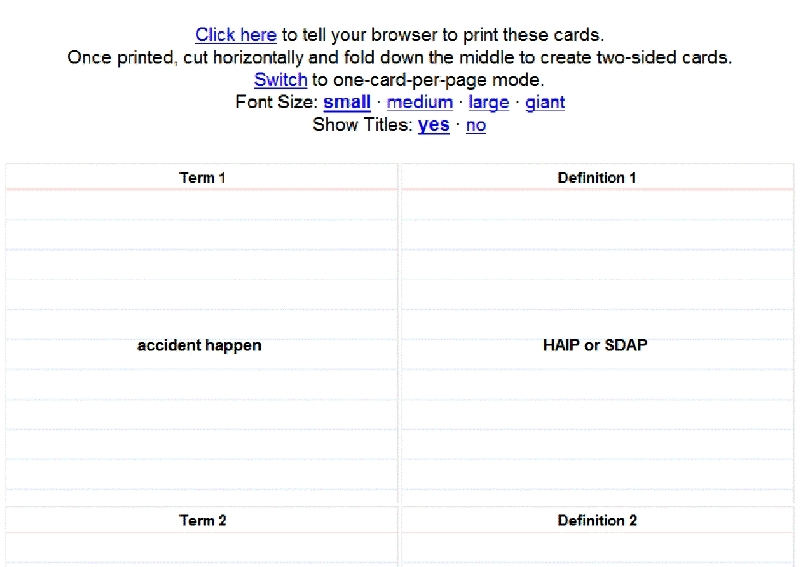 I recently discovered the most helpful tool in learning briefs -- sites where you can make your own digital flashcards! Basically, you make cards with the English word or phrase on the front, and steno on the back (or any other way you want; more on making them later, it's easy!). 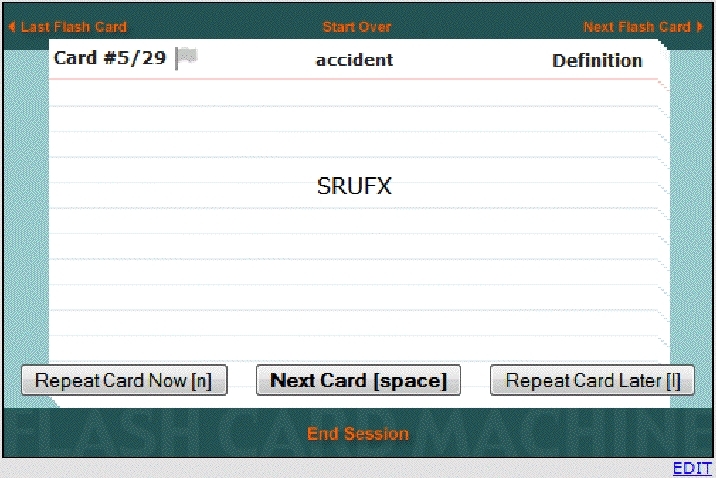 Once you have a few cards set up, you just start a realtime session in your CAT software, arrange the screen so you can see both the flashcard and your CAT software, and try to write each card as it pops up! This one is loaded with features, and has a very responsive tech team who added a "Court Reporting" category when I requested it! "What is so much better about this site than good old-fashioned flashcards or just writing lists of briefs?" 1) You can share your cards with everyone and look at cards other people have made. We can all pool our collective resources. 2) It's free (and easy). 3) They have a plethora of options. 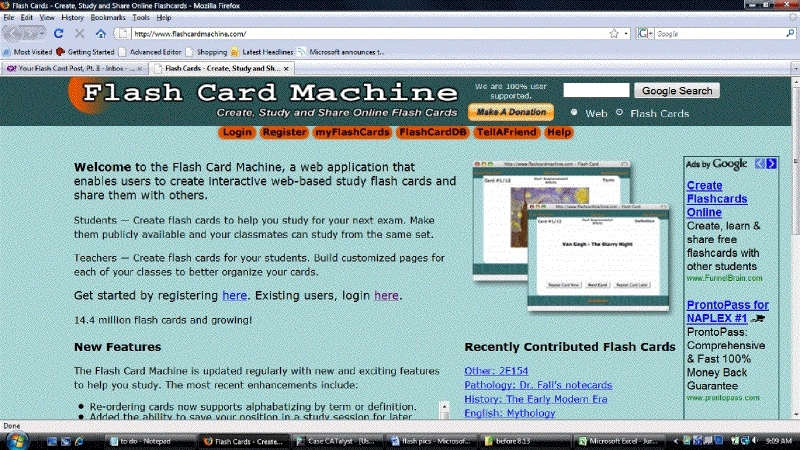 4) You can have the flashcard window open over your CAT software's realtime window so you can see your realtime and the flashcards at the same time. 5) It is very, very easy to create the cards. You can either do it from scratch -- which isn't bad for small lists -- or you can simply upload a text file as long as it is tabbed ("tab delimited" being the technical term). I will explain this more clearly later. 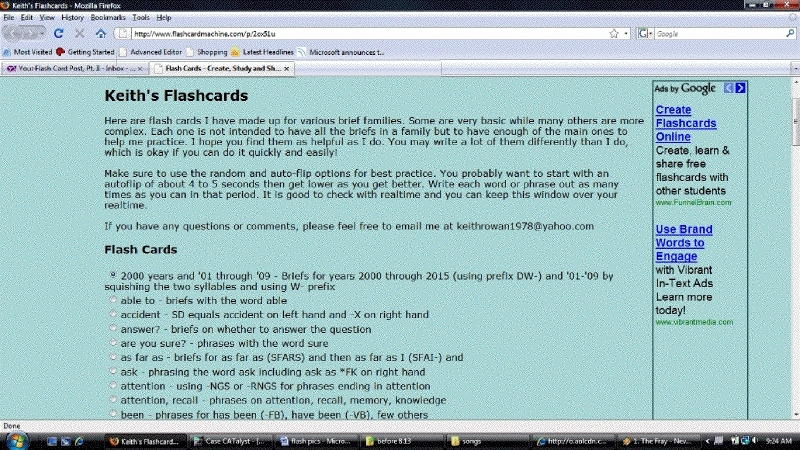 6) The flashcards are always available as long as you have internet. No carrying cards around or wasted effort. You get to keep your hands on your machine and write! 7) You can export your flashcards for use on your iPod, for those times when the internet is not available. On this screen, you can use the Advanced or Quick Editors to type in cards or you can choose "import" to upload a text file that is ready. You can also export a text file from your created set, Start Study Session and try those briefs. Make sure to choose auto-flip! This is the set up screen for the study session. The most helpful features are "Random," where I won't know which card will come up, and "Auto-Flip," so that I have to keep my hands on my machine and don't have to manually flip the cards. You can even choose how fast the cards flip! If you are just starting, you might put it to four or five second intervals. Then as you get better at a group of cards, decrease the interval to three, then two seconds ... and maybe even one second! It is good to write the word or phrase as many times as you possibly can before the next one comes up -- more muscle memory. From this screen, you can scroll through all your cards and print them if you wish, in various sizes. Feel free to study them to see if you like the program ... and not to metion seeing just what in the heck I'm talking about, here. If you like any of my cards, feel free to study them and use the briefs! Otherwise, create your own and you have the perfect study aid to learn new strokes! You have to highlight these, then copy and paste them into a text file Notepad) to be able to upload to the site. 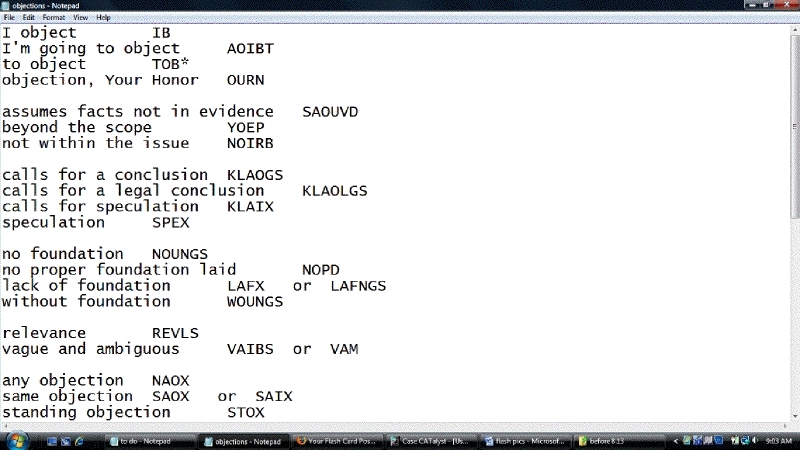 When you do this, the steno part will be tabbed over from the English because Excel has tabs built-in. 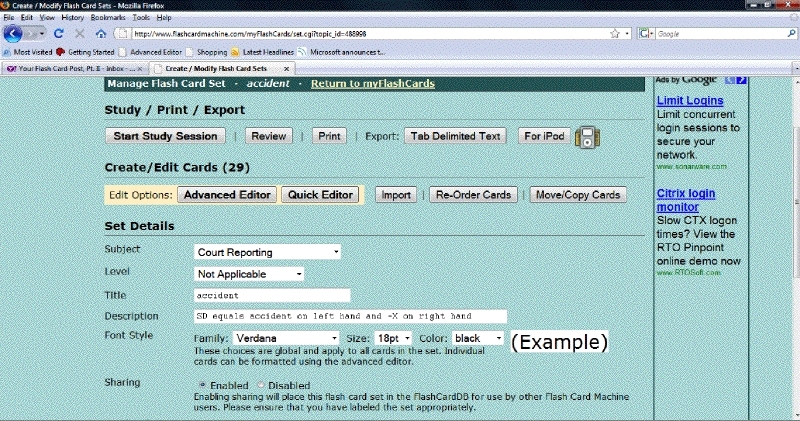 The text file you upload has to have tabs so that the site will know where the front of the card ends, and where the back of the card begins. Notepad Briefs: Ready to Upload! 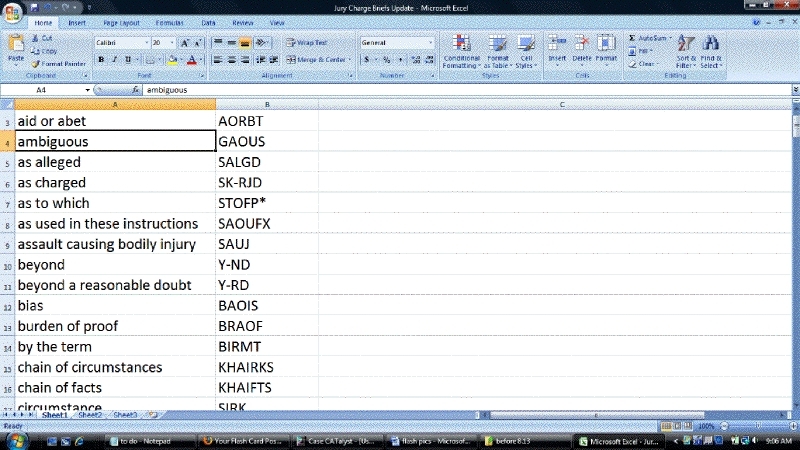 If you don't have Excel, but you have a word list in Word or somewhere else, simply paste (or type) the English word into a text file, then hit the TAB key, then paste (or type) the steno. That's how you manually create tabs: You just hit the TAB key. You'll just type on the front of the card and on the back, then save. Pretty simple, but it is faster to upload lists if you have them, rather than typing them again.